Make a smores cake for dogs! Smores are marshmallow treats well-known by campers. A marshmallow is roasted on the campfire, then placed between two squares of chocolate and sandwiched between two graham crackers. We have created a dog-friendly version of this yummy dessert. carob powder, which simulates the color of cocoa powder. Dogs will not know that it tastes a little different from chocolate! 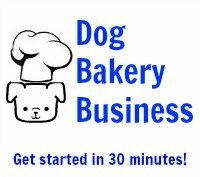 Real natural carob powder is a healthy alternative to carob chips and can be found at a dog bakery supplies store like K9Cakery.com. We use a small amount of miniature marshmallows for these dog cake recipes. Cover the bottom of the pan with the crumbled graham cracker. Pour the mix into the pan over the crumbled graham crackers. Add in the carob powder to the cake mix. Stir well by hand. Fold in the mini marshmallows to the mix. Sprinkle any remaining crumbled graham cracker over the top. Let the cake cool before removing it from the pan. To complete the smores cake for dogs, mix Magifrost dog cake frosting according to the directions. If you want to color it, add your icing color in, then stir until smooth and creamy. Add sprinkles on top if you desire. Then, let the frosting dry completely. It will dry hard and will not need to be refrigerated. 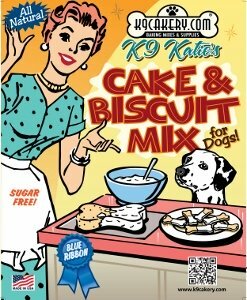 Click here for more dog cake recipes.